All of the TVs in Fortnite began broadcasting a warning of an impending storm on January 16, and a day later on January 17, a countdown timer was added. Epic Games added Fortnite v7.20 on January 15 and several leaks appeared that hinted towards a new in-game event simply called “Ice Storm”. One of the leaks included pictures of the broadcast appearing on TV along with different graphics. 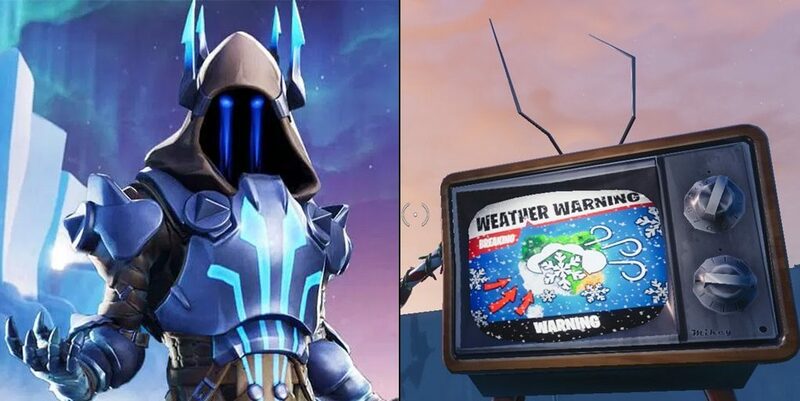 On January 16, all the TVs in Fortnite turned on to display of a “weather warning”. At around 2 pm EST on January 17, approximately, all the TVs in Fortnite were updated with a countdown timer. The timer will hit zero at 2 pm EST on Saturday, January 19. It is also interesting to note that Donald Mustard, the Worldwide Creative Director at Epic Games, updated his Twitter banner to show off Season 7, Week 7’s loading screen featuring the Ice King. The last time we saw a countdown in Fortnite, it was back in Season 4 with the in-game rocket launch event which had an attendance of millions of gamers. The rocket launch event was a historical time for Fortnite fans, as gamers hopped into matches to see the rocket take off from the bunker outside of Snobby Shores. We are not sure what the countdown could lead to, but maybe it could have to do with the ice sphere above Polar Peaks and the Ice King? MORE: Could Fortnite’s ice sphere and the A.I.M. skin be linked? What do you think will happen on January 19 when the countdown is complete? Let us know those theories in the comments!